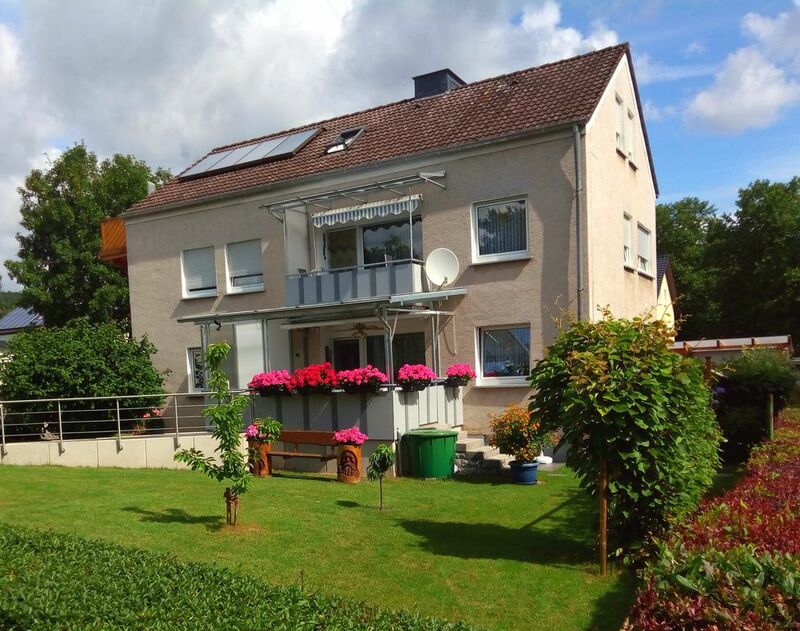 On the outskirts of Beverungen, near the forest, in the middle of the Weserbergland, the cozy apartment FEWO 1 awaits 2 to 4 persons, 10 min. Walk to the forest, 10 min. Walk to the town center. The apartment consists of two bedrooms, each with a double bed, a living-dining room with balcony, satellite TV, DVD player, CD radio and Wlan internet access, sleeping couch, a fully equipped kitchen with all the necessary electric appliances Microwave, coffee maker, toaster, water cooker, egg cooker, blender, juicer etc., and a bathroom with shower and a fixed shower enclosure and toilet. An iron with ironing board is at your disposal as well as a children's high chair and a children's travel bed. We can also pick you up with the bicycles in the evening when the Weser cycle path has become longer than you thought, or the forces are exhausted. The same is offered, of course, with the bicycles to a more distant destination in the morning. ich kann ihr Haus nur wärmstens weiterempfehlen. Es hat mir an nichts gefehlt und ihr Service lässt keine Wünsche offen. Bitte machen sie noch lange weiter so. Vielen Dank für diesen schönen Urlaub. Sehr geehrte Frau Jessica B! Es freut uns sehr, daß es Ihnen in einer unserer Ferienwohnungen gefallen hat. Dieses sagt uns dann immer, daß sich unsere Bemühungen gelohnt haben. Wir wünschen Ihnen weiterhin Kraft in Ihrem Alltag, damit dann auch für Sie die Sonne wieder scheint. wir hatten einige sehr schöne tage in dieser wirklich sehr gut eingerichteten ferienwohnung die unsere erwartungen übertroffen hat ! sie ist sehr schön und mit allen dingen die man braucht eingerichtet sehr sauber und mit sehr netten hilfsbereiten vermietern ! wir können diese wohnung zu 100% weiter empfehlen ! Die Wohnung war sehr schön groß und sauber. Wir wurden herzlich Empfangen und fühlten uns sehr wohl. Es war ein sehr schöner Urlaub in einer schönen Landschaft. Es freut uns sehr, daß es Ihnen in der Fewo 1 so gut gefallen hat. Auch das herrliche Weserbergland hat Sie wohl in seinen Bann gezogen. Wir würden uns sehr freuen, Sie mit Ihrem Mann hier noch einmal als unsere Gäste begrüßen zu dürfen. Bordered by vast forests, romantic castles and idyllic villages, the Weser winds its way through a unique mountain country. Midst of this lovely holiday region, directly on the Weser with the river Weser, lies Beverungen. Because on the one hand the beautiful surroundings just outside the door. Here you can take walks or hiking, enjoy the outdoors, get fresh air, relax and recover. So, as one wishes for the holidays. Anyone who wants can here in the footsteps of the Brothers Grimm, of Droste and Wilhelm Raabe and enjoy the nature by bike, open canoe and walk or just enjoy the healthy climate and fairy tale scenery sink in. Many destinations in the area can be very well connected with a bicycle tour. To learn to know not only the individual highlights, but also spend a lot of time in nature. With a combination of wheel and Weser ship you come very far and thereby experience a fun-filled and memorable day. Its convenient location Beverungens the river Weser and is surrounded by a well-marked bicycle network, there are numerous opportunities for guided or individual tours, which we offer as part of our Kul-Tour-pedaling. Without having no days off in Weserbergland made at least one trip on the Weser steamer! The nostalgic excursion boats of the fleet Weser provide a convenient opportunity to tap into the beauty of the landscape from the water. But even a "vision" -Fahrt with the "steamer" of Minden Fahrgastschiffahrt "White Fleet" lures. And of course the crossing with one of the typical Weser ferry on your program should not be ignored. Two of them run directly from the districts and Herstelle Wehrden. As a sporting variant offers a canoe trip that leads with a uniform flow through original river landscapes past romantic half-timbered villages and historic buildings. Good to know that the Weser can be explored by pleasure craft. Berths offers the marina Dreiländereck. But if you now go to Weser cruise, take the liner, or even take the helm in hand, one thing is certain: you will fall in love with this river!